In the summer of 1911, the relatively obscure Mona Lisa portrait was stolen from a Renaissance gallery in The Louvre Museum. The scandal soon made the Leonardo da Vinci painting a household name. A handyman Vincenzo Peruggia committed the crime, removing the wooden panel portrait from its frame and escaping in broad daylight the following day when the museum was closed. An entire day passed before anyone noticed the masterpiece was missing. Police failed to zero in on the handyman; Perruggia was only caught when he contacted an art gallery owner Alfredo Geri in Florence about the painting. 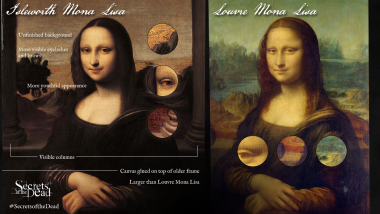 Secrets of the Dead: The Mona Lisa Mystery, airs Wednesday, July 9 at 10 p.m. ET on PBS (check local listings).